100% cotton t-shirt sporting the "angry cloud" design. we're got lots of colors and varying sizes (youth large to x-large). not to scare you or anything, but we're running low on t-shirts, so buy now before we come up with some new design that you hate. (if ordering via PayPal, please send me an e-mail specifying what size you want and your color preference). 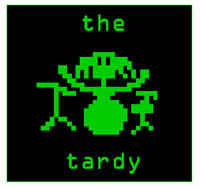 the first recording by the tardy. four very very catchy songs (you can download mp3s of all of them). features cowbells, keyboards, guest shouting by paul from sinkcharmer. you should own this. you can have a sticker for free. you like stickers, remember? ask us at a show or e-mail us.